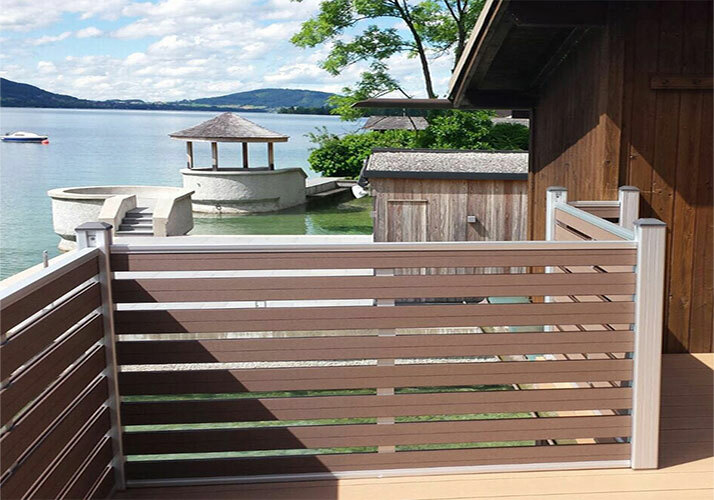 Wood plastic composite fencing become more and more popular in Europe, widely application in backyard, patio, balcony ect, at present we have agent in different countries, such as UK, Spain, New Zealand, Ireland, Philippines ect. (1)waterproof, moisture-proof. It solved the wood products of moisture or water damp environments tend to decay, the deformation of the expansion, you can use the traditional wood products can not be applied in the environment. (2) insect resistant, anti termite, effectively prevent insects harassment, prolong the product life. (4) strong plasticity, can be very simple to achieve personalized styling, fully embodies the personal style. (5) high environmental protection, no pollution and recycling the use of products. Benzene containing substances, formaldehyde can be recycled to greatly reduce the amount of timber used for sustainable development of national policy. (6)the workability is good, can be set, can be planing, sawing, drilling. (7) simple installation, convenient construction, does not require complicated construction process, saving installation time and costs. If you interest in wood plastic composite fencing, we can send to you free sample and quotes to u, with affordable price.